Luxury Real Estate on Bainbridge seems to be in full swing this Spring. In the last week, two listings each listed for around $8.5 million have come on the market in the prestigious area of Bainbridge known as Country Club. 11900 Country Club Rd, a magnificent home built in 2008 on 835 ft of waterfront is the single largest privately owned waterfront. 2000 Beans Bight is a stunning waterfront home reminiscent of Cape Cod and the Hamptons, with quietly elegant features and craftmanshp. Now, when you think of Country Club don't start imagining a huge clubhouse and a fancy golf course (although there is a golf course) and ladies "lunching". This "old Bainbridge" community dates back to the late 1800's when it was actually a farm of around 100 acres owned by Gus Sanders. Gus Sanders was a part of the Port Blakely Mill days just before the turn of the 20th century. Lately I have been reading about Captain Renton's Port Blakely Mill and some of the interesting people who lived during that time. Sanders had worked as a foreman at the Mill but then changed to a mill in Ballard. Then he made another change and began working as a gripman on the Front Street Cable railway. At some point Sanders decided to build a "clubhouse" for some of his friends to enjoy who were weekend sailors. Some of these men who included Stout, Heilbron, Pelly and Peters, eventually went together and bought 5 acres right at the tip of Restoration Point for $1000. Then the following year, they decided to purchase the remaining 103 acres for $22,500 and called themselves the Country Club of Seattle. Then hard times fell and they had trouble making payments. Sanders agreed to have them lease the property instead for 10 yrs and then buy it for $30,000. Eventually that happened and the members platted the land into 16 homesites and drew numbers out of a hat to determine who got what lot. The Moseback Farm which was located directly above Country Club (Upper Farms Rd area I believe) was then purchased from Nils and Fausta Elofson in 1908. 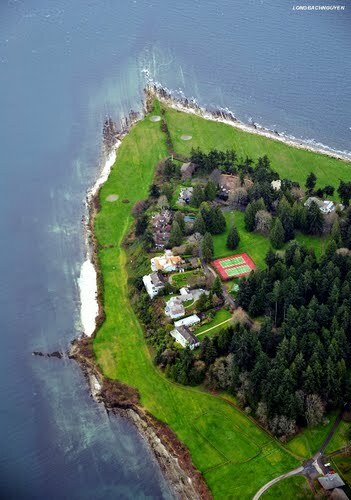 I can only imagine what these people would think of today when they see how their homestead has turned into some of the most prestigious and gorgeous property on Bainbridge Island. If you are interested in learning more about Bainbridge Island's history, you should check out the book "Port Blakely: The Community Captain Renton Built" by Andrew Price Jr. It's pretty fascinating stuff. Meanwhile, if you want to live the dream that these early pioneers founded, call me and I can arrange a private showing.